Being in a choir simply means being willing to lift our voices in praise to God on a regular basis. If you are called to become a member of an FPC vocal choir or handbell choir, please prayerfully consider saying "yes". When we hear God's call and answer it with a "yes", we receive great blessings. Call Alice Walker at 770-787-6915 for information regarding our music programs. Music is integral to our lives together as a community of faith. Through music, we glorify and worship God in uniquely talented ways. A wide variety of music programs, groups and special presentations minister to the needs and tastes of our entire church family. 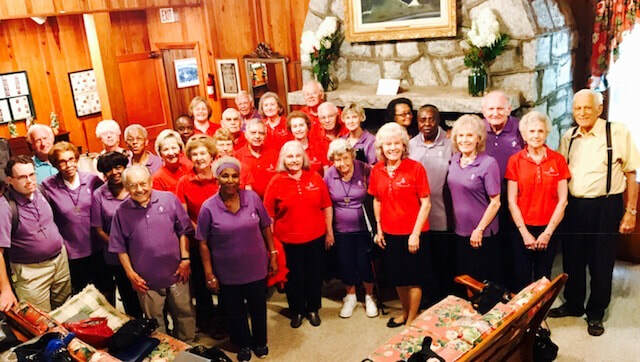 Choirs, including the Sanctuary Choir, Ambassador Choir and Handbell Choir rehearse weekly and bring musical offerings to worship services on a regular basis. Alice Walker, Organist & Ambassador Choir Director, received her Bachelor of Arts degree from Agnes Scott College, and Certification from the American Guild of Organists (CAGO) and (AAGO). In addition, Alice is a member of the Committee on Music and Worship for the Presbytery of Greater Atlanta, PC(USA). She has participated in Master Classes in organ with Jean Langlais, Diane Bish, Dr. Alec Wyton, Dr. Roberta Gary, Dr. Tom Trenny, Diane Belcher, and Dr. Gerre Hancock, is a touring Artist for the Southern Arts Federation and the Georgia Council for the Arts, and a lifetime member of Gideons Auxiliary International. First Presbyterian Church, Covington, boasts an outstanding pipe organ built by the Wicks Organ Company, Highland, Illinois. The Sanctuary houses the two-manual, 31 rank instrument with 99 memories, installed when the new Sanctuary was completed in 1995. The Sanctuary Organ, the firm's Opus 6292, was designed for the new building under the direction of Dr. John H. Roark. The organ is a wonderful asset to the church's music ministry and the instrument provides great leadership to the congregation in singing the faith. Numerous concerts have been given on the Wicks Organ, including recitals by Alan Morrison of the Curtis Institute, Samuel Metzger, formerly Senior Organist at Coral Ridge Presbyterian Church, in Ft. Lauderdale, FL, and currently, Senior Organist at Second Presbyterian Church, Memphis, Tennessee, and by Dr. Roark, Retired Pastor, First Presbyterian Church, Buford, GA, and currently Associate Organist, Peachtree Presbyterian Church, Atlanta. Other recitalists who have performed on the organ include: Dan Miller, Rodgers Organ Company; Bill Callaway, First United Methodist Church, Chamblee; Tom Alderman, Roswell United Methodist Church ; Jim Ingram, retired President/CEO, Allen Organ Studios, Atlanta, and currently organist at St. Stephen’s Lutheran Church, Lexington, SC; and Phillip Skerrett, Jr., Big Bethel AME Church, Atlanta. The church's organist, Alice Griffin Walker, CAGO, AAGO, has performed many concerts on the organ, and sometimes with her twin sister, Becky Griffin Ramsey, organist at First United Methodist Church, Covington. In 2007, FPC Covington, along with FUMC Covington, hosted concerts as part of the April meeting of the American Guild of Organists, Atlanta Chapter. A truly classic American organ, the Wicks instrument has been used to provide a wide variety of music for both worship and concert, and its sounds are complemented by the superb acoustics found in the Sanctuary. The Wicks Organ was the result of a very generous donation by the Patrick Family Foundation (Mr. and Mrs. Joseph E. Patrick, Sr. and Mr. and Mrs. Joseph E. Patrick, Jr.) in memory of Sadie Patrick Greer and Lee Alvin Patrick. An upgrade was made to the Wicks Pipe Organ in 2009, with the installation of an Allen Organ Company Vista MIDI, along with a transposer and a digital recorder for the organ. The Allen Vista MIDI enhanced the organ with 128 general MIDI sounds and 94 organ stops. In 2010, a Rodgers MX-200 MIDI was also added to the organ. The MIDI contains more than 1,100 sounds, selected by Rodgers' Dan Miller, a widely acclaimed organ recitalist who will be remembered in Covington for playing the "Festival Concert for Three Organs" in October, 2007, at FPC, Covington, with Alice Walker and Becky Ramsey. Both of these MIDI additions were given by Carol & Ellis Dunbar in honor of FPC Organist, Alice Walker.